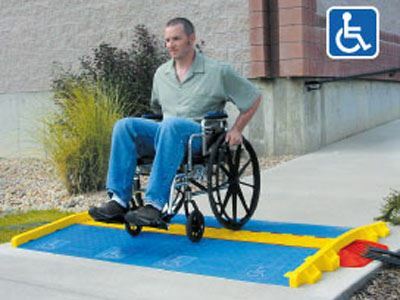 Cross-Guard ADA Compliant Ramps and Rails feature a gentle slope and slip resistant ramps to provide a safe crossing point for wheelchairs, carts and vehicles with small wheels. While these ramps and rails are the perfect solution for making events ADA compliant, they still allow users to have access to their cables and cords as needed. These ramps and rails can also be used in conjunction with Linebacker-compatible Cross-Link Protector Bridges and Cross-Guard Rail Barriers.